Park Service To Drain Lincoln Memorial Reflecting Pool After 80 Ducks Die : The Two-Way The deaths were caused by a parasite that can also lead to swimmer's itch in humans. Risk to people is "extremely low" because you'd need to swim in the pool, which isn't allowed — but has been done. 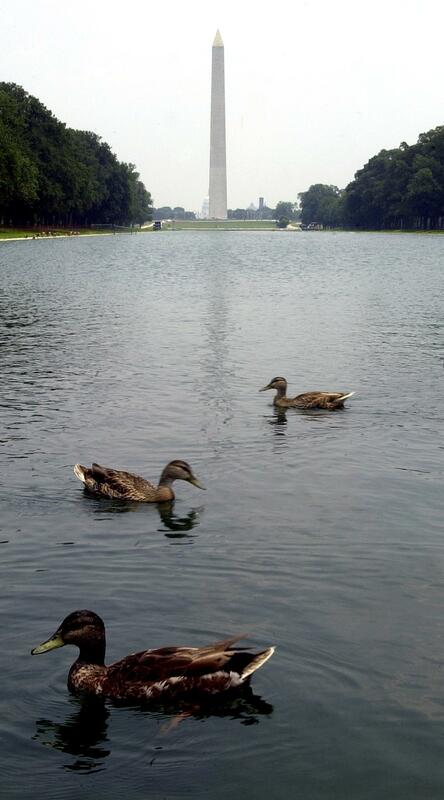 Ducks paddle in the Lincoln Memorial Reflection Pool in better days. The National Park Service announced it will drain and clean the Lincoln Memorial Reflecting Pool, after a water-borne parasite killed approximately 80 ducks there since May 20. The service said Friday that postmortem examinations done on the ducks by the U.S. Geological Survey's National Wildlife Health Center suggested that their deaths were caused by "high levels of parasites that develop and grow in snails that live in the pool." Chemical treatments alone aren't sufficient to reduce the parasite and snail population, it said, so the service needs to drain and clean the pool. In addition to killing ducks, the parasite - known as a schistosome - can cause swimmer's itch in humans, which is also called cercarial dermatitis. The CDC explains that the microscopic parasites "are released from infected snails into fresh and salt water (such as lakes, ponds, and oceans). While the parasite's preferred host is the specific bird or mammal, if the parasite comes into contact with a swimmer, it burrows into the skin causing an allergic reaction and rash." Does America Really Need The National Mall? 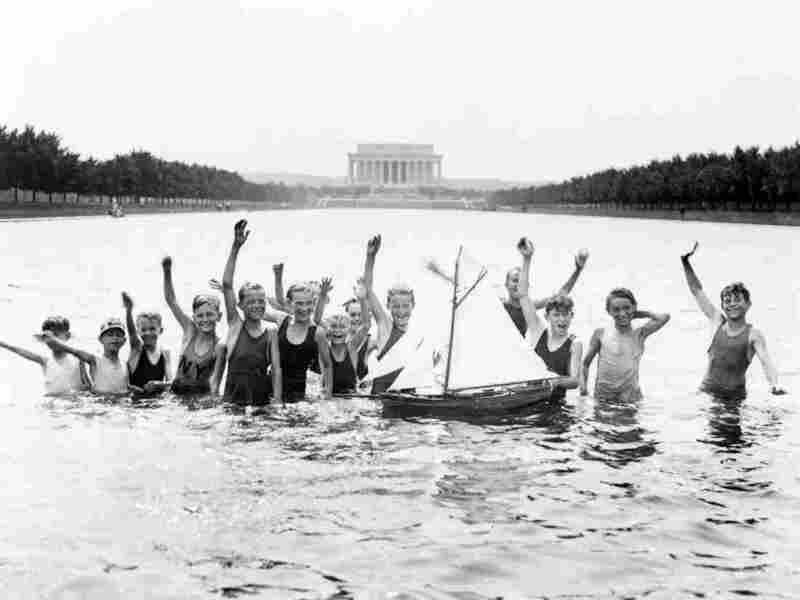 Boys swim in the Lincoln Memorial Reflecting Pool in 1926 despite the fact that it was forbidden. The draining will begin Sunday and the Park Service hopes to reopen the pool on June 19. In 2012, the Reflecting Pool was completely rebuilt with water conservation features. The bottom of the pool was also tinted to make it more reflective. How Pools Became Democratizing Forces In Rapidly Changing Washington, D.C. According to the site Histories of the National Mall, the District of Columbia operated three small whites-only public pools near the Washington Monument in the mid-1920s and early '30s, which were demolished in 1935. The site says that starting in the 1880s, there were segregated swimming areas near the Mall in the Tidal Basin: "In 1914, Congress voted to create an official beach on the Tidal Basin for white patrons. African Americans swam nearby in a segregated area that never received funding or buildings. Facing increased criticism from black leaders and concerns that the water was polluted, Congress voted to ban swimming in the Tidal Basin in 1925." A previous version of this story mistakenly labeled the parasite as the condition. The condition the parasite causes is known as cercarial dermatits. The parasite is known as a schistosome.